The Indian solar manufacturing industry is a heavily fragmented and uncompetitive one. Its costs and price are typically 15-20% more than the imported Chinese solar panels. The only reason why producers are afloat is because of the DCR (domestic content requirement) in some of the government tenders. While the cell capacity also exists, there are onlye 2-3 producers of those and they also run due to the government’s protectionist policies. The Indian government and industry has failed to create a vibrant industry, despite strong dometic demand and a long history of solar manufacturing in the country (Webel, Tata BP Solar etc.). While MNRE shows that the current capacity of solar panels is 5000 MW and a leader of an industry group claims that it will increase to 10000 MW, what will be the use of these panels. 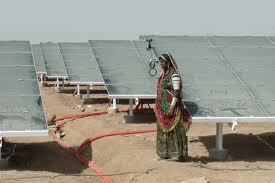 A recent report shows that India imported 75% of solar panels last year from China alone. Another 10-15% would be imported from countries such as Malaysia, Taiwan, USA which would mean that Indian players would be making around 500 MW of solar panels, which implies a factory utilization for the overall sector at just around 10%. Also read Is India’s Solar Industry moving to a Fixed Tariff model from Reverse Auction tenders? Increasing the capacity to 10000 MW would not make sense, given that most of the capacity is lying unutilized. I would suspect that a large portion of the current 5000 MW capacity is junk and obsolete. Creating more capacity does not make sense unless the Indian players can be cost and technologically competitive. While the new plant made by Adani of around 1.2 GW makes sense from the scale perspective, most of the other Indian solar power plants are just 50-100 MW in size which makes them completely useless in being sustainable over the long term. Mr. Saluja from SEEMAT has boldly said that capacity would double. Yes it could but what is the value addition to the Indian economy or the players themselves. Yes the demand in the Indian market is there, but can the Indian players even hope to be compettivie to serve the Indian demand. The Chinese companies are already selling solar panels at 40 cents/watt and might go lower, if the overcapacity persists.The Indian companies do not have a snowball’s chance in hell of selling these panels at those prices. Even Mr Saluja’s company makes a pathetic 100 MW of solar panels and 50 MW of cells. This makes no sense from a scale perspective. Large Chinese companies have a capacity of around 4000-5000 MW and are still fighting to make decent margins. India is also likely to double its module and cells manufacturing capacity to 10,000 MW and 2,000 MW in the next couple of years. However, “lack of easy and cheap funding, expectations of a high GST rate and increasing cheap imports from China and Taiwan is hurting the domestic industry,” said Singh. WTO final report on DCR is on 16th Sep , My best guess is that Once report is out against India , then MNRE might move quickly and announce integrated solar manufacturing policy as the counter measure to support the domestic manufacturing.